Sophomore Sensation Day provided a way for the Hopkins High School sophomore class to get to know one another in a large group workshop Oct. 25 and 26. 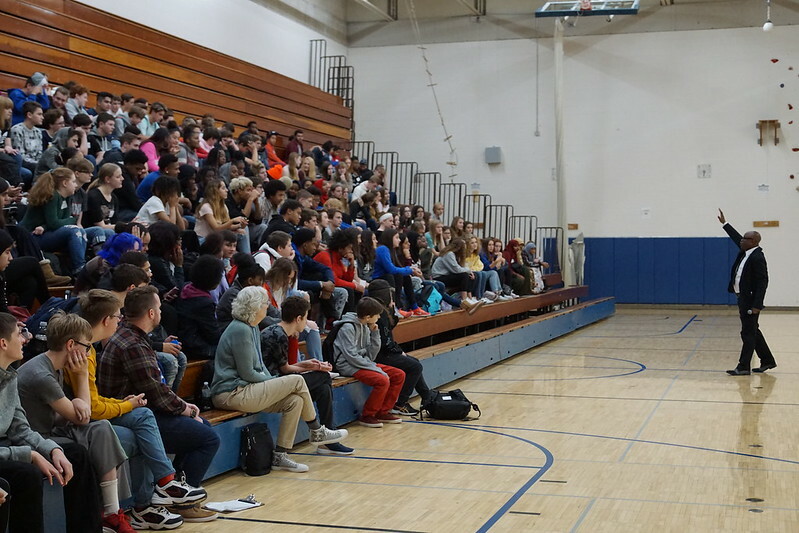 Guest speaker Derek Emery spoke to 557 Hopkins sophomores about three traits for high school success — believe, belong, and become. Hopkins High School principal Doug Bullinger said administrators chose a speaker for the sophomores as a way to create unity since they came to the high school from about a dozen different schools. "Bringing them together for an event like this allows them to press pause on classroom learning for a couple hours and give time to learn about each other," Bullinger said. "Our goal with an event like this is to bring about more connectedness within the sophomore class." Emery is a youth inspirational speaker with a commitment toward positive development in youth leadership instruction. His passion and enthusiasm were evident as he spoke to students. He harnessed the sophomore’s attention with several activities involving movement. One activity involved students being asked to sit back-to-back while linking arms. They had to stand up without becoming disconnected. Following the large group workshops, four smaller groups made up of about 20 students each met for a leadership workshop. Emery said that academics is not the only thing educators should teach future leaders.